Let's get right to the point: this is an incredibly versatile 4 person shelter for backpacking--but it can be used in any number of ways for any number of purposes. Black Diamond is a company that knows how to cover the market needs of its consumers. They don't just make the most popular type of tent; they continue to develop and design 2- and 3-person tents, family tents, bivy sacks, and shelters. And while it might seem that a company devoted to so much diversity may be spreading themselves too thin, Black Diamond consistently offers some of the best hiking, backpacking & camping equipment. The Mega Light shelter isn't for everybody, sure, but if you're on the hunt for one of the best light weight, incredibly portable, and very durable shelters, you should definitely give it a look. 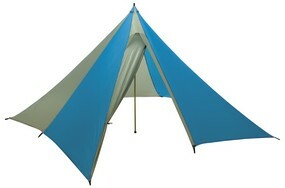 This is certainly one of the best simple, 4 person shelters on the market. Size - Lighter than some bivy sacks, but offers much more space. Easy Set-Up - The simplistic design lends itself to a speedy assembly. Sturdy - Holds up wells against Mother Nature's nastier moods. But as long as that laundry list of positive attributes and advantages is, there are still some drawbacks to choosing this 4 man shelter over another. That aside, the price ($259.95 on Backcountry.com) certainly leaves something to be desired. Yes, this is an excellent 4 person backpacking shelter, and we here at Camping Tent Reviews think it's truly worth your time to investigate, but it's also just a simple shelter. And if you are going to be spending up to three hundred dollars on a simple shelter, the very least the manufacturer could do for you is factory seam seal it. Unfortunately, this isn't the case with the Mega Light backpacking shelter. But do the negatives outweigh the positives? No way. At just a mere 2 lbs 5 oz, the Black Diamond Mega Light shelter is smaller than many bivy sacks and just as portable. But instead of fitting just one person (and maybe his or her pack), this spacious shelter (51 square feet) can sleep up to four campers, and fit a lot of gear under its roof. The simple circus tent design of the Mega Light means that you can have it up and sheltering you in less than two minutes. This quick assembly makes it an ideal shelter for waiting out passing storms. As light and simple as it is though, this sturdy shelter that can withstand whatever elements you decide to pit it against. Rain, sleet, snow, hail, and even high winds are no match for this great backpacking shelter. For such a high price, though, the Mega Light tent really should have more features and be a little better constructed. After all, these shelters are little more than glorified tarps strung over a single pole. At the very least, they should be waterproofed by Black Diamond before they're put on the shelves. The truth is, if you want this shelter to repel water (instead of inviting it right in), you're going to have to seam seal it yourself, or have someone else do it for you. 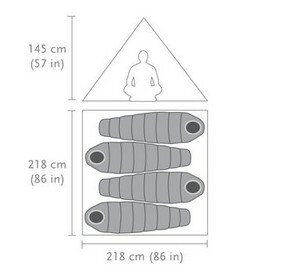 Eventually factory seam sealing will be an industry standard (it's a wonder that it isn't already), but for now you need to pay attention to which shelters are and which aren't. You certainly don't want to get caught in a storm with a leaky tent. The Black Diamond Mega Light tent may have its share of problems (steep price tag, no factory seam sealing), but overall it is a fantastic shelter. The simple design allows for quick and easy assembly, and even though it's as light as they come, it will stand tall in even the worst weather. Bottom line: if you're in the market for a shelter like this one, then you should definitely give the Mega Light your further consideration. Have you used the Mega Light?